BUFFALO, N.Y. -- "Nobody should live with dizziness," says Lixin Zhang, M.D., PhD, director of the Dizziness, Balance, and Tinnitus Center at DENT Neurologic Institute, one of the most comprehensive dizziness centers in the world. Born and raised in China, Dr. Zhang graduated from Weifang Medical College at the age of 21 and went on to complete six years of neuroscience research, earning a PhD degree from Beijing Medical University. He then received a National Institutes of Health Fogarty Visiting Fellowship at Bethesda, Maryland in 1993, where he undertook six more years of basic neuroscience research under the supervision of renowned bipolar expert Dr. Robert Post. 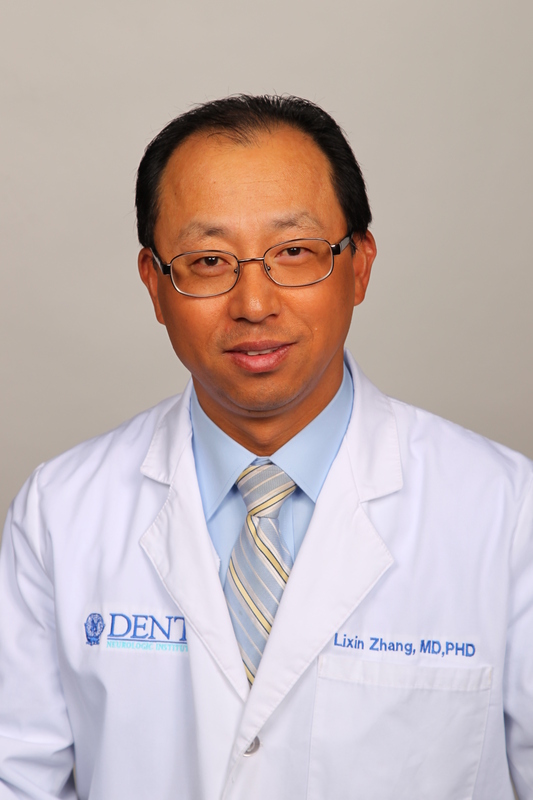 Dr. Zhang finished his residency and fellowship training at University of Buffalo, joined the Dent Neurologic Institute in 2004, and began building the Dizziness Center in 2009. He said, "In year one we saw 500 patients, in year two we saw 750 patients, and in year three we saw 1,000 patients. Now we see 1500 new patients every year and estimate that this reflects just 10 percent of Western New Yorkers who are suffering from the effects of chronic dizziness and imbalance issues. Often, individuals see an ENT for vertigo, when most of the underlying reasons for what they are experiencing are neurological, particularly when their symptoms involve chronic dizziness." What makes Dr. Zhang exceptional is the years he has devoted to laboratory research that now guides his clinical practice, as reflected in five posters hanging in his hallway to reflect the data he has collected. One of Dr. Zhang's biggest successes is use of the anti-seizure medication Lamotrigine to treat Meniere's vertigo and migraine-associated vertigo, which may revolutionize vertigo treatment. His initial observation study found that 90 percent of patients with frequent Meniere's vertigo responded to the medication and 50 percent of the responders became vertigo-free. He later confirmed this finding with a small, double-blind pilot study, which led to his successful patent application. He is now leading an effort to get FDA approval for this new indication. Based on his research and clinical experience, Dr. Zhang developed the theory that chronic dizziness/vertigo may be related to CNS vestibular center neuronal hypersensitivity or hyperactivity. He says, "This explains why Lamotrigine should be used to treat migraine-associated vertigo and why anti-anxiety medications are successful in treating chronic subjective dizziness, commonly associated with underlying anxiety disorder." Dr. Zhang explains that there are about 15 different types of vertigo, each requiring its own treatment. However, following his protocol he has been able to cure or improve a patient's symptoms with 90 percent success. If a patient does not respond positively he is able to tell them why through state-of-the-art vestibular testing at the center. Three years ago, Dr. Zhang also started a tinnitus program in which he managed 300 tinnitus patients. He said, "Although we have not found a cure, most patients' tinnitus has improved." Dr. Zhang is truly a healthy hero. He simply wants to help make people feel better. He is a husband, a father of three children, and a wonderful son to his own parents. To make an appointment with Dr. Zhang to determine if your dizziness or tinnitus can be helped call 716-250-2000 and visit www.dentinstitute.com/people/lixin-zhang-m-d-ph-d.